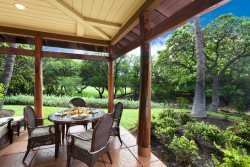 Waikoloa Beach Villa is a relaxed haven for the entertainer and features three bedrooms, three full bathrooms, and accommodates up to eight guests comfortably. The location is within a 2-minute drive is the famous Anaehoomalu Bay (A-Bay) beach with all the joys of white sand, trees, snorkeling, and more. Further down the road (10 to 15 minute drive) are other local beaches, whether you want the pristine white sands of Hapuna Beach, or the rocks, trees, and safe entry spots of nearby "Beach 69" (at mile marker 69). Open-plan living and dining area offers plenty of room making entertaining family and friends easy. The living room is full of verve and sunshine and features an L-shaped sofa and a large flat screen TV. There is an uninterrupted flow between the living and dining area making it easy for communication between hosts and guests. A user-friendly kitchen comes completely stocked with high-end appliances, dining table with seats for eight, and a center-island breakfast bar. Outdoor entertaining is well catered for and features a covered dining lanai with an outdoor kitchen, built-in BBQ and a dining table with seats for six. There is also additional seating on the second lanai area off the main living area. From the main living room area you can retreat to the guest bedroom on the first floor with a queen size bed, there is no TV in this room for the perfect quiet reading and relaxation room with a bathroom in the hallway. Proceed upstairs to the master suite where a beautiful king-sized bed can nurture your soul. The master bathroom with a deep-soaking bathtub and a separate walk-in shower for a private oasis. The guest bedroom upstairs offers two twin beds, flat screen TV and a private en suite bathroom. Additional guests may enjoy the use of the queen size sofa sleeper in the open loft area (no TV in loft). Also included is a full-sized washer/dryer, air conditioning and ceiling fans, ice chest, boogie boards, beach chairs, snorkel gear, beach towels, and complementary parking and complimentary WIFI. Too tired to cook or looking for a night out, there is also dining at the Kings and Queens’ Marketplaces adjacent to the property where you can enjoy fine dining, local fare, and take out/fast food. There is a basic “start-up supply” of: laundry detergent, garbage bags, kitchen sponge, liquid soap, dishwasher tabs, paper towels, toilet paper, shampoo/conditioner, small bar soap and salt/pepper. Cooking oils and spices are not provided. Once the startup supply runs out, guests are on their own to purchase additional supplies if needed. Cleaning solvents are not supplied. We have a well-thought-out guidebook to the local area, complete with sections describing Waikoloa Beach Resort and all its offerings, important phone numbers, Big Island life information, a guide to beaches, shopping, activities, Luau/Dining, and Golf. Your team member, Anne Marie, was especially helpful and a pleasure to work with. She was very knowledgeable, communicated with us as necessary and arranged contract for our stay in the same condo for 2019. Kim Horton was also very good in letting us know that packages were delivered to your office and ready for us to pick them up. This was a nice feature to have packages delivered to your office where we were assured they would be safe until we arrived. Maintenance was excellent and very responsive to providing another propane tank and replacing some light bulbs that were burned out in the condo when we arrived. Since we rented the same property for 2019, it tells you how much we enjoyed our stay and the features the property offered. WBV is well maintained, but the location is excellent where you can walk to shops and even to the beach. We never found the pool areas to be crowded and we enjoyed meeting some owners and interacting with others staying on the property. Beautiful property, well maintained and extremely clean. Excellent team members, very friendly and easy to communicate with. There were a couple of things that we wanted to bring to the owners attention. She was extremely helpful and had Resorticahawaii come right out. It is good knowing that there is always someone there to help with whatever our needs. We absolutely loved the unit and have already made plans for several return trips. We plan to rent the same unit again. It was perfect for our family. Thank you!! Nice unit, very spacious and comfortable for a large group traveling. They were all very nice. For the most part it was nice. The a/c was annoying but I know things wear out. We just happened to be there when it chose to start. The two drains we reported our last evening should have been caught by the maintenance team before we got there and the burned out light bulb, but they weren't big deals. That is why we put up with them until you asked at the last day. It's a nice place. We liked it very much. Very courteous and accommodating. We asked to check in 1 hour early and it was arranged without issue. We also asked to check out at noon vs 10:00 and, again, it was arranged without issue. We loved the property. Unit P4 in the Waikoloa Beach Villas is a high-quality rental, well-maintained and well-appointed. My family and I had a wonderful stay. Everything was perfect and it was like being at home. One minor thing that did stick out was that I had to call to get the wifi password. I thought it would be readily available when we arrived at the house. Beautiful place to stay and look forward to being there again. We had very little contact with your team but when we did, they were always courteous and helpful. Our stay was very pleasant! Everyone enjoyed the pool and the location was excellent with shops and restaurants nearby.